This is probably the last time campaigners can sit back and pause for breath before the dash to the May 3rd poll and the Welsh general election finishing line. The overwhelming impression has been of delivering leaflets in continuous sunshine. It makes up for all the campaigns in years gone by, foot-slogging through horizontal driving rain, trying to push soaking leaflets (with the ink running, of course) through doors in the hilly villages of the Neath and Aberavon constituencies. One has to add, what a transformation towns like Banwen and Cwmllynfell undergo when the sun is out. The writers of this blog would like to take the opportunity to thank all the party members and others who have put themselves out for this campaign, and in campaigns past. We also send our good wishes to campaigners throughout Wales. It's things like Sajjad Karim's fight for human rights which remind me that party politics is about principle, and why I am in the right party. "What we need is the dominance of principle over fashion. agenda, but the Lib Dems had been talking about it "for a long time". rights, but had been shown to be right. Commentators complain that "all parties are the same", because we appear to concentrate on which of us is better at managing the economy, the health service, civil order, education, the environment and the rest. I happen to think that we really would do better in England and Wales* than the other parties, because so many of our members are practical people - working professionals, small business people and middle managers - but that's not really the point. Our approach stems from the party philosophy, expressed on page one of the constitution, and unchanged since the party was set up. Our opposition to the invasion of Iraq stems from our belief in the rule of law, internationally as well as locally. Our support for devolution is based not so much on assuaging pride in a native country or language, noble though these things are, but from the philosophy that government is best when it is closest to the governed. Our support for keeping open and, indeed, enhancing, local post offices stems from a belief in local communities, not just courting local opinion for electoral reasons, then ignoring it when in power. We believe in open government, even if it means that pressure groups with which we do not totally sympathise may make use of the results. One could go on. There are others. The point is that because vital promises are rooted in the philosophy of the party, they will be kept if we get into a position of power. *We have already shown what we can do in Scotland. 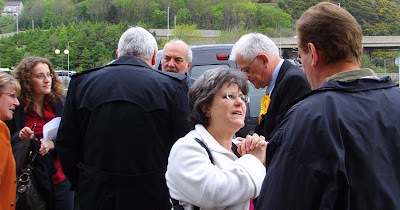 Peter Black (far right, talking to BBC reporter Janet Cohen) and party workers, prior to a well-received "meet the people" walk through Aberavon. "Under this Labour Assembly Government more and more dentists have left the NHS with the result that communities like Resolven are left without a proper service. It is not reasonable to expect people to have to travel such distances to see a dentist. 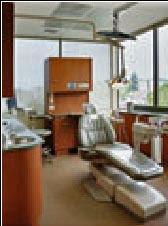 There is a need for Resolven to have a dental surgery of its own. "Welsh Liberal Democrats are also campaigning for Salaried Dentists to visit Primary Schools to provide free check-ups. How green are political parties? While we were delivering our tabloid in Gwaun-cae-Gurwen today, a citizen accused us political parties of hypocrisy. "You all say you're green," he said, "but all four of you are sending out bits of paper to everyone which aren't read." Since, at the time, he was using a pressure-washer to clean a piece of garden statuary, I don't think he was arguing from a green point of view. However, he did have a point. The trouble is, I explained to him, that all the other parties do it, so we have to. Political parties are in the position of Leslie Lever, one of the founding fathers of Unilever, who reckoned that only half of his advertising was effective. The trouble was, he didn't know which half. The effectiveness of our advertising is somewhat less, but if we stopped it, the voting figures would show it. PS It seems from a letter to Peter Black that the Green Party in Swansea is the worst offender of the lot! Following Tony Blair's praise for LibDem-run Cardiff's renaissance, Welsh Labour's recent election broadcast highlighted the dramatic reconstruction of Swansea (run by a coalition in which Liberal Democrats are in the majority). The Labour leaders of Neath Port Talbot council must be quite put out. There is large-scale building going on - the southern distributor road, the refurbishment of the Gwyn Hall, Llandarcy village, the gas pipeline (well, perhaps that last is a bit sensitive), yet Neath and Aberavon receive not even a name-check. The uncharitable may think that the Labour parliamentary party does not like Dr Gibbons, Gwenda Thomas or Cllr Derek Vaughan. Coalition conspiracy-theorists could believe that Labour is deliberately boosting the Liberal Democrat vote. The truth is more likely to be that the New Labour machine, run from London, has lost touch with the party's roots. It probably turned over the production of its election media to bright political graduates with presentation skills, but no knowledge of local government. If Scotland, why not Wales? The Scottish Liberal Democrat manifesto has just been launched.